Mish's Global Economic Trend Analysis: Fed Study Shows "Persistent Fed Overoptimism about Economic Growth"; What Will They Do About It? 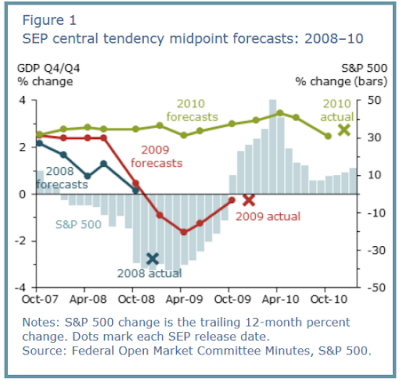 Fed Study Shows "Persistent Fed Overoptimism about Economic Growth"; What Will They Do About It? Since 2007 nearly every Fed economic forecast has been on the optimistic side. In an attempt to explain, a new Federal Reserve Bank of San Francisco dives into the Persistent Overoptimism about Economic Growth. My friend "BC" commented "It has taken 7-8 years for Fed economists to get around to this brilliant insight." Since 2007, Federal Open Market Committee participants have been persistently too optimistic about future U.S. economic growth. Real GDP growth forecasts have typically started high, but then are revised down over time as the incoming data continue to disappoint. Possible explanations for this pattern include missed warning signals about the buildup of imbalances before the crisis, overestimation of the efficacy of monetary policy following a balance-sheet recession, and the natural tendency of forecasters to extrapolate from recent data. Economic forecasting can be a humbling endeavor. In a cross-country study of private-sector forecasts from 1989 to 1998, Loungani (2001) finds that “the record of failure to predict recessions is virtually unblemished.” He also finds that forecast revisions in one direction tend to be followed by further revisions in the same direction and that one-year-ahead growth forecasts are typically too optimistic. An updated study by Ahir and Loungani (2014) finds that the private-sector’s record of failure to predict recessions remained intact through 2008 and 2009. A study by Alessi, et al. (2014) finds that one-year-ahead growth forecasts from the Federal Reserve Bank of New York and the European Central Bank from 2008 to 2012 exhibited substantial overoptimism, averaging 1.6 to 2.4 percentage points above actual growth. The SEP growth forecasts fit the pattern of these various studies. That question is easy to answer: absolutely nothing. There is a systemic bias towards optimism from economists in general, not just central banks. I have mentioned that numerous times in recent years, even after it was long understood the recession of 2007-2009 was a balance-sheet recession. For example, on January 6, I noted Economists Upbeat Despite 4th Consecutive Decline in Factory Orders; Auto Orders vs. Expectations. On January 29, Fed Chair Janet Yellen met with Senate Democrats at a private luncheon. She told the Democrats that the U.S. Economy is Strong. “She went through the issues of unemployment and inflation. Very positive. And economic growth numbers were good, have been good. There’s work to be done,” Sen. Richard Durbin (D-Ill.) said after the luncheon. 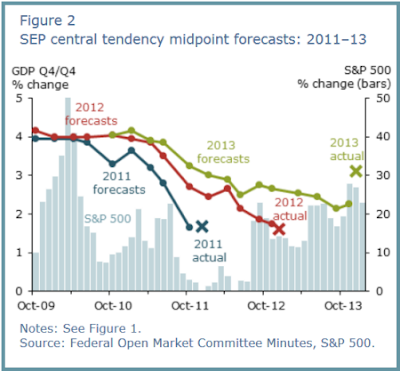 Could the Fed be rear-view mirror forecasting once again? I think so. Third quarter GDP rebounded strongly, so Yellen did what economists do, project strength into the future. Somehow this tendency is one-sided. Economists seldom project weakness the same way. On January 31, I went Diving Into the 4th Quarter GDP Report and noticed some ominous trends. On February 1, I made a pretty bold statement Canada in Recession, US Will Follow in 2015. Today, I noted Total Construction Spending Weaker Than Expected; Residential Construction Spending in Contraction. Also today, but something I did not comment on, U.S. Consumer Spending in December Weakest Since 2009. U.S. consumer spending recorded its biggest decline since late 2009 in December with households saving the extra cash from cheaper gasoline. "The consumer is poised to do well in early 2015. Lower gasoline prices are going to provide a big lift to consumption," said Ryan Sweet, a senior economist at Moody's Analytics in West Chester, Pennsylvania. Natural tendency of forecasters to extrapolate from recent data. Bernanke like Greenspan could not see the obvious. This is a general statement. Buildup of imbalances has nothing to do with it. Neither Greenspan nor Bernanke could spot bubbles. Janet Yellen right now is virtually blind as a bat. She cannot see the bubbles in bonds and equities the Fed created. When those bubbles burst, the slowdown should smack some sense into the Fed, but it won't. Moreover, the bigger this equity bubble gets, the bigger the crash. The Fed cannot see that either. These arrogant fools actually believe they are economic wizards who can steer the economy like a truck on a highway. The idea that central banks can set interest rates is as faulty as Russian central planners can correctly set the price of oranges. But that's what they believe. They are extrapolating 3rd quarter GDP into the future again right now. They miss the bond and equity bubbles, factory orders, and countless other things. All strong reports are thought to be representative. All weak reports are deemed to be a "soft patch". Judging from the "strong economy" statement of Yellen, the Fed seems to believe the US will "decouple" from the clearly slowing global economy. It has for a while, but it cannot last. The Fed (economists in general) have far too much faith in economic models and far too little common sense. The economy cannot be driven like a truck. Fat tails appear far more than theory suggests. Why? Because many widely-held theories are complete nonsense. Anyone recall the widespread belief people would not walk away from their homes? And what about the idiotic Keynesian theory that recessions and inflation could not happen at the same time. Economists widely believed that bit of nonsense. Yet, instead of abandoning Keynesian theories, they went further down the rabbit hole to explain things. Here's a final bonus explanation the San Francisco Fed failed to mention: Good news sells. People do not like the truth. They would rather hear lies. And the Fed is willing to provide lies, especially in difficult times. The Fed does not want an audit? What pray tell does it have to hide? European politician Jean Claude Juncker summed it up nicely: "When it becomes serious, you have to lie". And so the Fed does. Sometimes, as a matter of arrogant belief in their own wizardry, they even start to believe the lies they tell.